Pianist Naomi Niskala has appeared as soloist and chamber musician in Europe, the Middle East, the United States, Canada, Russia, Thailand, and Japan, and her performances have been broadcast on BBC Radio and NPR's Performance Today. Her competition awards have included first prize at the 1996 Kingsville International Isabel Scionti Solo Piano Competition, and a top prize at the International Stravinsky Awards Competition in Illinois. Attending two summers each at Tanglewood's Music Center and Ravinia Festival's Steans Institute, Niskala also toured on the first ï¿½Musicians from Ravinia's Steans Instituteï¿½ tour with violinist Miriam Fried. She was later invited by Zarin Mehta to Israel, Turkey, and Greece to perform chamber music for a Ravinia Festival benefit. Niskala also performs as a member of ADCA, a chamber ensemble based in New York City. Niskala has established herself as one of the prominent scholars of the solo piano works of American composer Robert Helps (1928-2001), and has been invited to perform and lecture on these works at universities and halls in the United States, Canada, Japan and Germany. Her release of the first complete recordings of Helps' solo piano works on two discs with Albany Records in 2007 was met with high acclaim, and the first volume was chosen by ClassicsToday as one of its "2007 Best of the Year" discs. Recent performance highlights include the San Francisco Symphony Chamber Series at Davies Symphony Hall, Spectrum Concerts Berlin at Philharmonie Hall in Germany, and soloist with the St. Petersburg Chamber Philharmonic of Russia, as well as performances in Jacksonville, Naples, and St. Augustine, Florida, at the Icicle Creek Music Center in Washington State, the Wuerth-haus in Berlin, the Eastman School of Music, Eastern Washington University, Penn State University, the University of Manitoba, the Philadelphia Museum of Art, the College of Staten Island, New York, and Niigata University in Japan. Niskala returned to Berlinï¿½s Philharmonie Hall in 2010 to perform with Spectrum Concerts Berlin and to record the piano chamber works of Robert Helps for Naxos Records, and joined them again in 2011 at Carnegie Hall. This upcoming season will include concerts in Thailand, Italy, Kosovo, and on Spectrum Concerts Berlin's 25th season, with the release of chamber works of Ursula Mamlok recorded by Spectrum Concerts Berlin on Naxos Records. Born to Japanese/Finnish-American parents, Niskala began studying piano at the age of three. She was raised in Rochester, New York and later in Tokyo, Japan. Niskala holds degrees from the Yale School of Music, the State University of New York at Stony Brook, and the New England Conservatory of Music, and also attended Tufts University. She received her Master of Music and Doctor of Musical Arts degrees in Piano Performance with Gilbert Kalish at Stony Brook, and an Artist Diploma with Claude Frank at Yale. Other teachers include the late pianists Patricia Zander and Maria Luisa Faini. Niskala also studied chamber music with pianists Leon Fleisher, Peter Serkin, and Menahem Pressler, violinists Louis Krasner and Eugene Lehner, and bassist Julius Levine. Niskala taught on the faculties at the Neighborhood Music School in New Haven, Connecticut and Wesleyan University (Connecticut), the University of South Florida's School of Music, and the University of North Dakota. 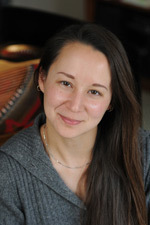 During the summer Niskala teaches at the Interlochen Arts Camp, and she is currently Associate Professor of Music at Susquehanna University in Pennsylvania where she teaches piano, theory, and leads a summer chamber music exchange program to Japan. "Naomi Niskala is a bold, rigorous, poetic champion of this tough-minded but eclectic composer. (Robert) Helps's legacy is in good hands." "Pianist Niskala impresses through the extreme dynamic changes executed completely without any technical losses..."
"Niskala's... (playing has) brilliant, hard textures and finger work balanced with gorgeous differentiations of textures." "Niskala nurtures a soft silky tone but produces a wide palate of sounds...(Frank Dodge, cello, and Niskala) do what they do extremely well because they do it without pretentiousness...both of them so truthfully and lovingly do their own thing." "Pianists Naomi Niskala and Oksana Ezhokina with percussionists David Herbert and James Lee Wyatt III played (the Bartok Sonata for Two Pianos and Percussion) superbly throughout. I've never before heard it done as well. And this they accomplished without a conductor to help hold things together. The unity of attacks on even syncopated notes was picture-perfect, and that with little eye contact amid the musicians. It was uncanny, like some kind of telepathy at work..."